The twenty-first century is symbolic of the rise in the number and variety of gadgets. There are amazing technologies, blended with need and fun, which are taking a form of the cool gadgets of this time and making people go gaga over them. In the list of cool gadgets, hoverboard is the trendy thing of this age that not only is attracting the kids but is instead more popular among the teens and people of the age group of around 30. “Skque” line of hoverboards, or as we understand as the self-balancing scooter, is doing an excellent job of introducing new features in the machine. Though a slightly newer company, opened in the year 2003, this brand has made and maintained a satisfactory client base and hence, its new product, i.e., the X1 series is not so surprisingly the talk of the town! And today, we are going to review this product for you to help you with the decision of buying this self-balancing scooter or not. 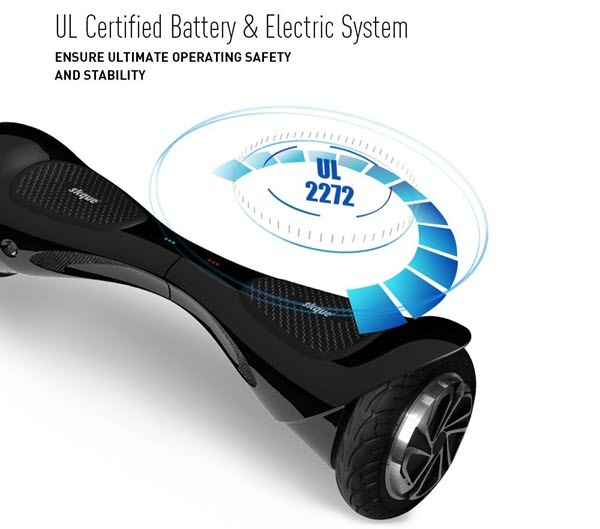 The new Skque X1 Hoverboard series has marked its entrance with the most attractive feature of the UL 2272 certification which in an instant makes it all the more cool and reliable. As trendy and hip as it looks, X1 Hoverboards come with chic features like Bluetooth speakers and LED lights. And there’s more! They come in three sizes, i.e., 6.5 inches, 8 inches, and 10 inches, and you can choose the perfect size for you according to your need. The 8” black hoverboard is available on Amazon at $499.99 only with free shipping and buying now which means you will be saving 23% on its actual value. You should grab this deal before the offer is called off. Let’s know more about it before we reach a conclusion. Skque X1 hoverboard is an automatic two-wheeled self-balancing scooter. 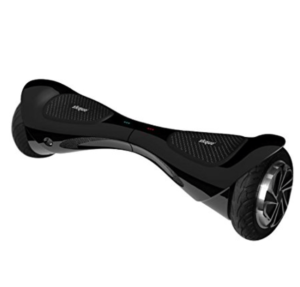 Its automatic function gives stability to the user, avoiding the risks of falling off and getting injured. Better stability makes it easier and more comfortable to operate and control too. This self-balancing scooter has a very desirable feature of zero turning radius. What does it mean? The turning radius being zero means that you can just stand at one spot and turn the hoverboard in a full 360-degree circle. Well, doing that for fun is great, but what we are talking about is the advantage it gives to the customers, which is that you can easily operate this gadget at very narrow spaces even in areas where it is usually hard to do anything except walking. It also comes with an all new and improved motherboard having gyro sensors. The motherboard has a strong shell and chassis to give it a rugged and cool look as well as it results in greater durability and satisfaction. The professionally put and tuned sensors, as the name suggests, provide the scooter-rider a smooth and fun ride. The self-balancing scooter can carry the load of up to 264 lbs or 120 Kgs which is great as it caters to people with varied body mass and weight. With the maximum load, its speed can reach up to 7.45 mph, meaning you’ll enjoy the light breeze as you move on this machine. With a battery capacity of up to 44000mAh, and taking charging time of only 1-2 hours, it can travel up to 20 km on one full charge. It also comes in 3 sizes and thus, is convenient for people to choose their comfortable one. The X1 hoverboard has two motors of 350 Watts each. These driver motors are adjusted within the wheels of the gadget, and thus, they can simply be controlled with the feet. They also ensure faster response and thus, give the rider the comfort of easy acceleration, breaks, turns, and rotations. Oh yes, you can turn it 360 degrees as many times as you want! 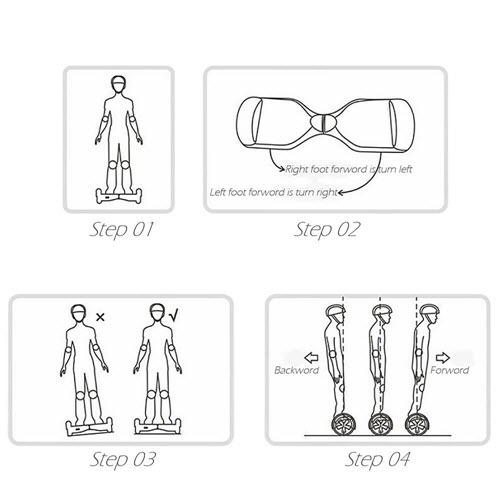 Now, for how to use it, you can use the X1 self-balancing scooter with three simple steps. First, press the power switch. After it is on, put one step on the foot switch to trigger it, and the scooter will instantly come in self-balancing mode. Now put the other foot to control it and make it go forward, backward or turn. Remember to maintain your balance even though it has sensory features to avoid the risk of falling from sudden breaks or acceleration. Skque X1 series hoverboards come in three sizes, i.e., 6.5”, 8” and 10”, each representing the size of the tire. All the hoverboards of this series have got some exciting features that can instantaneously attract the customers to buy them and take on a ride. Let’s have a look at the features and see if they make it worth buying. It might not look like a very attractive, let alone important feature of a self-balancing scooter but that would only mean that you are a fresher in this field. 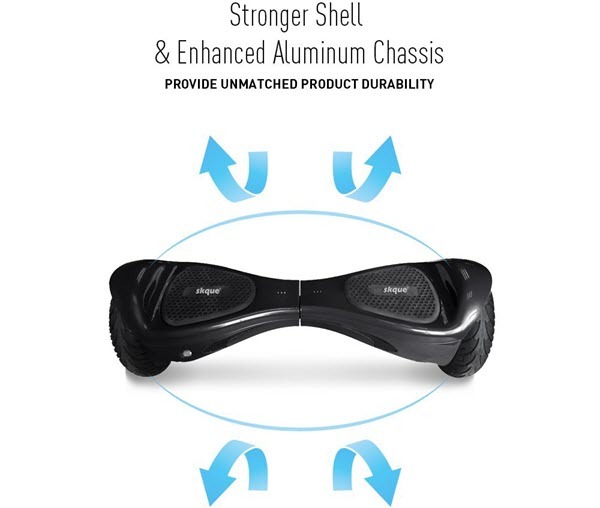 The hoverboard enthusiasts cling to the brands that have UL 2272 certification for it instantly does a quality check of the product that they are going to spend money on. What is this UL 2272 certification in the first place? If you are wondering about this, this is where you get the answer. UL is a standard fire and electrical safety measurement and certification of self-balancing scooters. A product having UL 2272 certification means that it has successfully passed the tests, evaluating the safety of an electrical drive train system as well as the charger and battery system combinations. Skque X1 hoverboard having UL 2272 certification makes it one of the top contenders in the self-balancing scooter market. It providing a ‘safe to use’ label gives mental peace and satisfaction to the customers and their families as well as manufacturers, traders, and retailers alike. 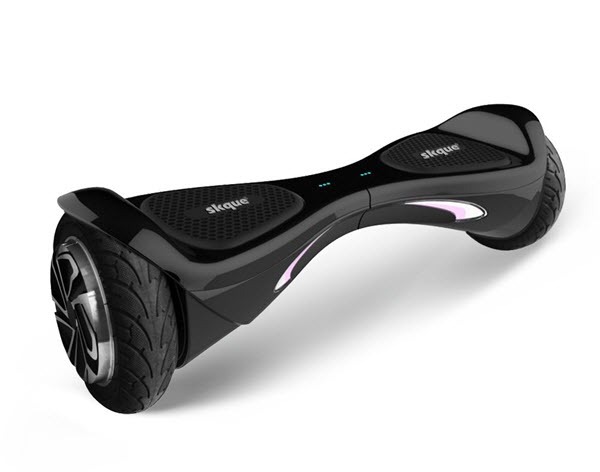 The Skque X1 hoverboard has crashed the market with a stronger shell than any of the previous Skque models. The strong shell accompanied by enhanced and improved chassis makes it a very durable self-balancing scooter. In fact, this is one of the most durable of all the self-balancing scooters made and sold till date, thanks to the experts who have worked thoroughly to make it have a strong shell for user support and convenience. Apart from that, the X1 series is gifted with an innovative motherboard, again, better than any of the models that have been launched by Skque in the past. The professionally tuned gyro sensors applied to the motherboard of this machine help to detect the movements fast and efficiently, giving the rider the smoothest of rides. Because of its stronger and improved motherboard, this hoverboard is very reliable as well. The whole charging system of Skque X1 hoverboard, regarding its built as well as utility, does not disappoint the users in the least. Instead, it comes with an all new and improved charge control system to attract the customers. The prime credit about its charging system comes through UL 2272 Certification which immediately gives the impression that the charging system is safe and secure to be used by the consumers as well as their families. The charging system of these self-balancing scooters can confidently be called proficient as its charge control has been improved and increased by 15% of the speed by which the gadget gets charged. To charge the battery to the full, it only takes one to two hours, and you can go up to 20 kilometers with one full charge, depending on terrain conditions. Safe charge, quick charge, what else does one want, right? There are three things that make the Skque X1 series of hoverboards very trustworthy and dependable. First, as we have already established, is the UL 2272 Certification which in itself is a standard of labelling a product safe and reliable. Secondly, the Skque brand is a U.S.A. brand. How does that matter? Well, a product being an American brand has to do with the mental brand loyalty of the customers as American brands are recognized as trustworthy brands, working towards utmost customer service and satisfaction. The third quality that makes X1 hoverboard so reliable is the warranty of one year that comes with it. This 1-year warranty is a limited warranty which covers parts of the Skque self-balancing scooter. If anything goes wrong, you can always seek for the solution to the problem from Skque. Skque X1 self-balancing scooter comes with some really cool and flashy features that can make the riding experience of the customers all the more better and thrilling. There are two most highlighted features of this gadget. The X1 hoverboards come with a built-in Bluetooth speaker which of course is wireless. You can directly connect your phone to the wireless speaker through the Bluetooth function and listen to your favorite music along the way of your ride. No drive is better than the one with songs that your mood desires, is not it? 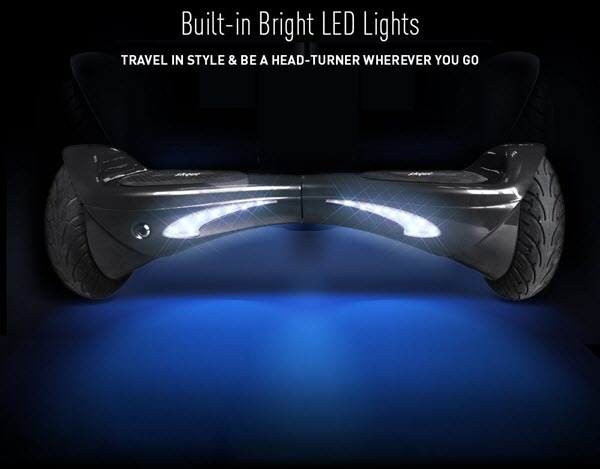 Another striking feature of this gadget is the application of LED lights in the scooter. The existence of LED lights not only gives an eye-catching image and impression to the others on the road but also ensures safety at night with drivers being wary of your flamboyant presence. Skque, though established quite recently, has come up with various self-balancing scooter models, each better than the last one. Skque X1 is undoubtedly the best model that has come yet. 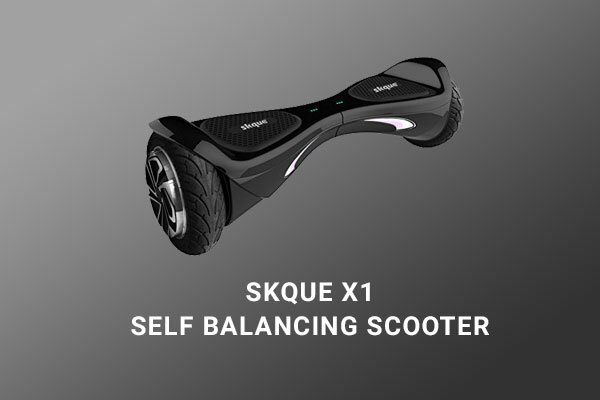 This latest and coolest hoverboard by Skque is being tried and tested by many hoverboard enthusiasts. Coming in three sizes and various delightful features, it certainly has a place in this industry. Let’s have a look at its pros and cons quickly. The Skque has constantly been improving its hoverboards to build a strong client base and giving its users great consumer satisfaction. The Skque X1 series is the example of their ever improving self-balancing scooters as it comes with the better motherboard, charging system, and cool features such as Bluetooth speakers and LED lights. On top of that, this series also comes with UL 2272 Certification which ensures that it is user-friendly and safe to use. The 8 inches Skque X1 Hoverboard can be bought on Amazon at $499.99 only with free shipping which is quite good for people who love this gadget. Although there are some other brands with competitive prices and different quality features, X1 hoverboard is an experience to cherish overall for adults and children alike. The people who are not brand loyal with this gadget as of now and are open to trying new self-balancing scooters should give it a try, if nothing but for its confined space riding experience. In conclusion, I would give the Skque X1 (maximum 264 lbs) self-balancing scooter a 4.2 out of five stars. Though there are always a lot of corners for improvement when it comes to electronics, this hoverboard does not disappoint you at all. It gives the riders a different kind of experience in the field of this emerging cool gadget and is totally worth the money that you will spend on buying one. Pick your favorite color, decide on the suitable size, and order today to avail Amazon discount or buy it directly from the Skque website. Hope this information helped. Happy riding on your new hoverboard! Hi Skque i need a replacement battery 4 my skque hoverboard 8.9 in please! !